Preheat oven to 350°F. 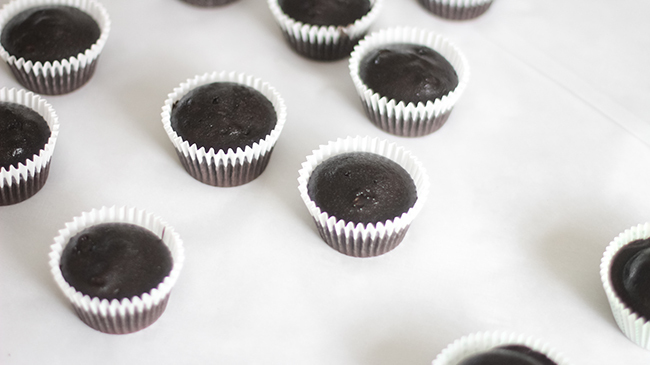 Spray the cavities of one or two nonstick cupcake pans with cooking spray. Whisk together flour, cocoa powder and salt. Melt the chopped chocolate and butter in the microwave at 30 second intervals until the two can be stirred together and the mixture is smooth (this took about 2 minutes in my microwave). Alternatively, heat the two together in a small saucepan over low heat until melted; stir to combine. Beat the sugar and eggs together on medium-high speed in the bowl of an electric mixer until the mixture lightens, about 4 minutes. Decrease mixer speed to low and slowly add the chocolate mixture to the egg mixture. Gradually add the flour mixture and beat until combined. Pour the Guinness Draught in a thin stream down the side of the mixing bowl with the electric mixer at medium speed. Batter will be thin (see video). Scrape down the batter bowl and mix again to be sure all the ingredients are well distributed. Pour the batter into the prepared baking pan(s) about 2/3 full. Bake for 15 to 20 minutes, or until a toothpick tester comes out clean (my batch was well baked at 15 minutes). Let the cupcakes cool completely before topping them with the meringue. Place the Guinness Draught in a small saucepan and bring to a simmer. Let the beer cook until reduced to 1 tablespoon, about 20 minutes. Let cool. Using an electric mixer beat the egg whites until foamy. Add the pinch of tartar and mix again until the mixture thickens slightly and becomes opaque. Gradually add the granulated sugar and beat until the mixture holds stiff peaks. Fold in the marshmallows using a large rubber spatula. Fold in the beer reduction. 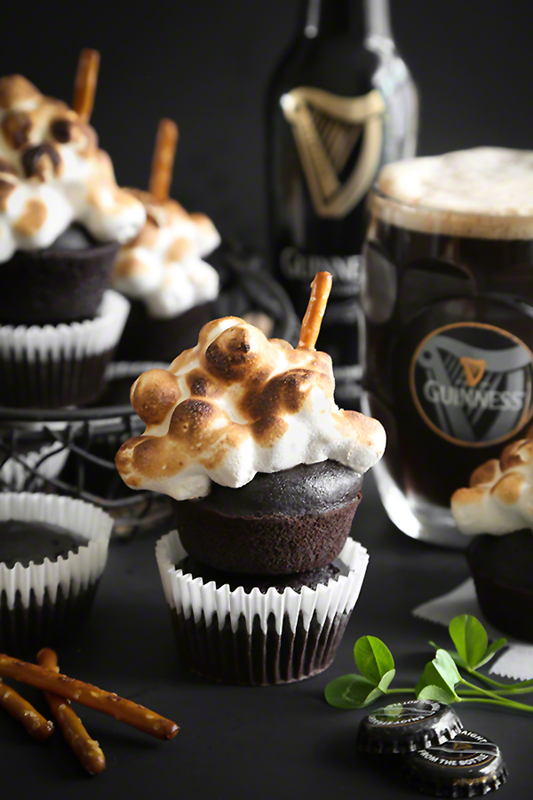 Pile meringue high atop each cupcake and brown with a kitchen torch. Alternatively, place the meringue-topped cupcakes on a large baking sheet and place them under the oven broiler for a few minutes (watch them constantly to prevent burning!) until the meringue is well browned and slightly puffed. Insert a pretzel stick in each cupcake. Let them cool for 1 to 2 minutes before enjoying. the visual here is outstanding--i'm so impressed with your creativity! as a bonus, these must be extraordinarily delicious too. bravo! 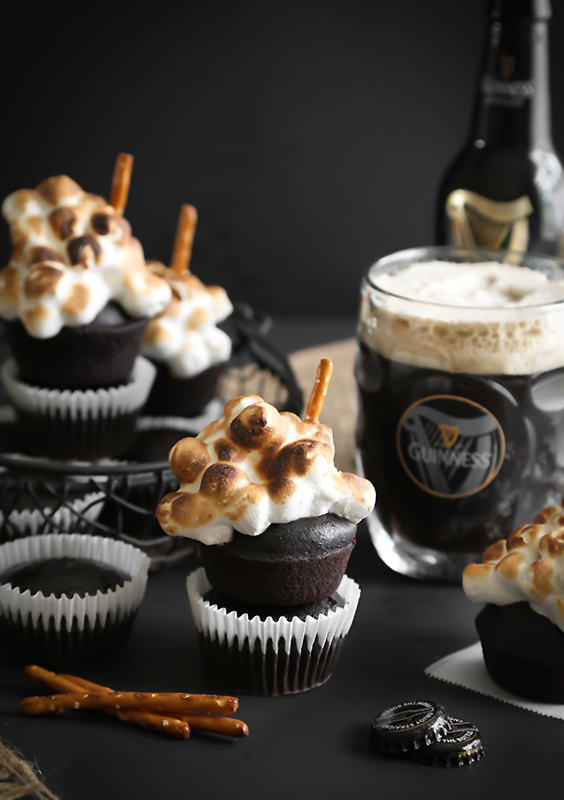 Beer marshmallow meringue is GENIUS! Looove the white decor on those cupcakes! Fantastic! Those are great cupcakes. Wow! This is a work of art! This is seriously genius on a whole other level. SO fun! Love the video & the music. I have a couple of bottle of Guinness in the fridge, waiting for chocolate cake. So, maybe tonight, Li'l Daisy & I will bake these sweeties! NOW THIS IS SINFULLY GOOD! I keep having problems with my cupcakes falling flat as soon as they leave the oven. I notice that there is no baking powder or soda listed, is the Guinness supposed to be the levener? If so, what else could cause the cakes to fall into really dense and delicious brownies instead of the domed and fluffy delights shown? Most chocolate stout cakes are pretty dense (these are) but they shouldn't be falling flat after they leave the oven. It's hard to say what happened. The Guinness is the only leaven used in the recipe. Overbeating can contribute to fallen cakes, so be careful when mixing the beer into the batter. It might be a good idea to calibrate your oven, too. I like to use an oven thermometer that hangs right inside the oven to gauge the temperature. An under-heated oven can cause dense or fallen cakes, too. Otherwise - if things are still not going as they should, you can always add a little baking soda to the mix. I suggest using 1/2 teaspoon for this size batch of cakes.